A tremendous THANK YOU to Suzie Smithwick and her Pond Tour Committee for planning and implementing this year’s Pond Tour. There were 12 participating ponds, perfect weather, and a very good turnout. In the North Valley, Elizabeth Good reported a steady stream of people viewing their pond and Jon Romberg had 70 visitors. In Scottsdale, Fran Thurber also reported a continuous flow of people throughout the day, with 61 guests compared to only 35+ last year. 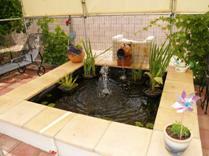 It was amazing how many people were interested in building ponds but had no idea where to start. Many didn’t realize there was a pond club nor that there were so many pond people close to where they lived. Membership applications were at all locations and the forms disappeared very quickly. A few guests signed applications. Elizabeth Good will have digital pictures at the May meeting for those who missed the Tour. Proceeds benefit Friends for Life. The GPPS May meeting will be held Saturday, May 12th at the home of Deborah and Mike Hazel. The meeting will begin at 9:00 am. The Hazels live at 3431 E. Norwood Circle, Mesa (480-659-7409). The program will be a forum on Pest Management . 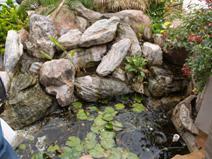 Many pond owners are plagued by herons, coatis, mosquitoes, and other nasties. Please bring your ideas and inventions to the meeting to share. Elizabeth Good will have her laptop computer with photos from the Tour. 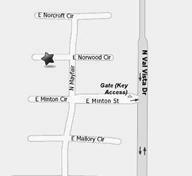 Directions: Off the 202 freeway Val Vista exit, drive south on Val Vista crossing E. McDowell to E. Minton (about 300 yards on the right). A gated community, the password is 0700. Turn right at the circle, and Norwood Circle is the first left; 3431 is on the left.